As probably anyone working in an office environment, I'm frequently confronted by the demand for multitasking. Different projects need to be managed, there are estimation, analysis, coding and debugging requests, phones are ringing, questions need to be answered. It really drains you, and is counter-intuitive to my goal of working at a sustainable pace. Now I have found an interesting approach that could help me in my ambition to do more unitasking, while still being available for other tasks. I got the idea from a comment in the above blog post, it's the Pomodoro Technique. The Pomodoro Technique was conceived by an Italian in the 1980s, who tried to focus on upcoming exams, but was not getting anywhere due to procrastination. He came up with this idea: get a kitchen timer, set it to a specific time, like half an hour. In this period of time, do a single task. 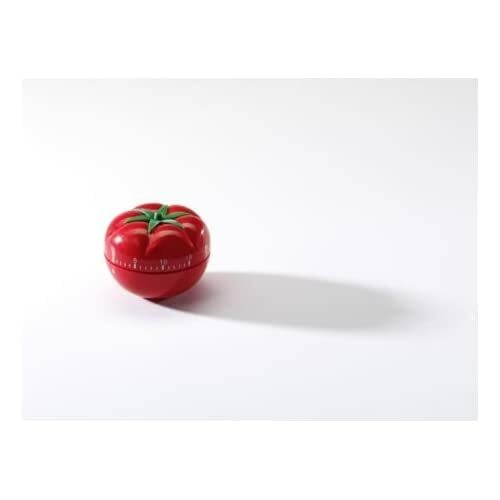 His kitchen timer was in the shape of a tomato, that's why the technique is called Pomodoro. A pomodoro is also the name of a single unit of focus time. If you are unable to focus due to internal disturbances (wandering thoughts, need to check e-mails, etc) or external disturbances (phone's ringing, someone trying to talk to you), don't give in to the temptation to react in-depth immediately, but document it so you can address it after the pomodoro, then re-focus an continue. By this you get a better understanding of the concepts of urgency and importance (see also paragraph three of this blog post), and learn to get things done. At the start of the day, you create a backlog of tasks. Then you pick a single task for the next pomodoro. The typical length of a pomodoro is 25 minutes, it is indivisible, so if you finish early, you should review your work, not start anything new. If you get interrupted by something important, the pomodoro is void. You can never resume a pomodoro, you have to start with a new one. If you have very small tasks, you can combine them into a single pomodoro, but this is not really recommended. After each pomodoro you have to do a 5 minute break, which is a real break where you are not allowed to do anything work related. Stand up, walk around, stretch, eat or drink, or tell someone a joke. After four pomodoros, a longer break of around 15 minutes is required. If you manage to complete a pomodoro (which is different from completing a task), you can already consider it a success. You have managed to stay focussed, which is all you really can do. You can now measure how many pomodoros you get done in a day, it's quite tough if you do it by the book. I managed to get 7 pomodoros done last Friday (first day I tried it), but I was hoping for 10-12, so there is still some potential. There are various concepts of time: For example, you can look at it as a continuous flow, or as a sequence of events. The first approach easily suggests that time is slipping away, you're running out of time, or that time is passing. This may lead to anxiety, and puts pressure on people trying to get things done. If you look at it like a sequence of events, time does not exist independently of you, you are part of it. This puts you in control of time, not vice versa. The Pomodoro Technique tries to teach us the second perspective by having successive periods of focus time, which help you find a rhythm, which again gives you security. Another thing the technique tries to do is to act as a focus enabler. Imagine a professional football player always tying the left shoe first, and then the right shoe. You might think of it as superstition, but it is a ritual which helps the person build focus on the upcoming event. Just like this, the winding of the pomodoro timer acts as a focus enabler. The winding symbolizes your commitment to the next pomodoro and helps you get in a flow. It is recommended to use a mechanical timer, as you would not get the same feeling with a software timer. The official website has everything you would want to know. There is a free e-book, a cheat sheet, template backlogs, links to user groups and so on. The e-book is definitely recommendable if you want to start using the Pomodoro Technique. Another interesting thing I found was a talk by Staffan Nöteberg, author of Pomodoro Technique Illustrated, which I haven't read. There are also billions of software timers out there. Update: I'm currently using Pomodroido. I have started using the Pomodoro Technique last Friday, and I wonder if I can keep it up. Although the creator says it is suitable for teams, I assume it will be the source of conflicts, if not the whole team is using it. But I will try to make it work, and will let you know how that plays out. I assume it will definitely work for individuals, and very likely in pairs. What are your thoughts on this technique? Is it something you would use? What drawbacks do you see? Or are you already using it? I'm curious about some feedback.